GB Railfreight (GBRf) has this week confirmed that it has acquired sixteen class 56 locomotives from UK Rail Leasing Ltd (UKRL), along with a number of spares and materials. The purchase, which includes a mixture of both serviceable and stored, non-operational ‘donor’ locomotives, is a result of the continued growth in the railway services that GBRf provide. The company could not confirm nor deny any prospective plans for re-engineering the locomotives at this stage, as this is still subject to the final contract. However, it has stated that some of the locos will be moved from Leicester to various locations across the UK for further storage pending the option of re-engineering, whilst a small number could remain at Leicester and returned to service as ‘standard’ class 56s. Above: A glimpse into the future? 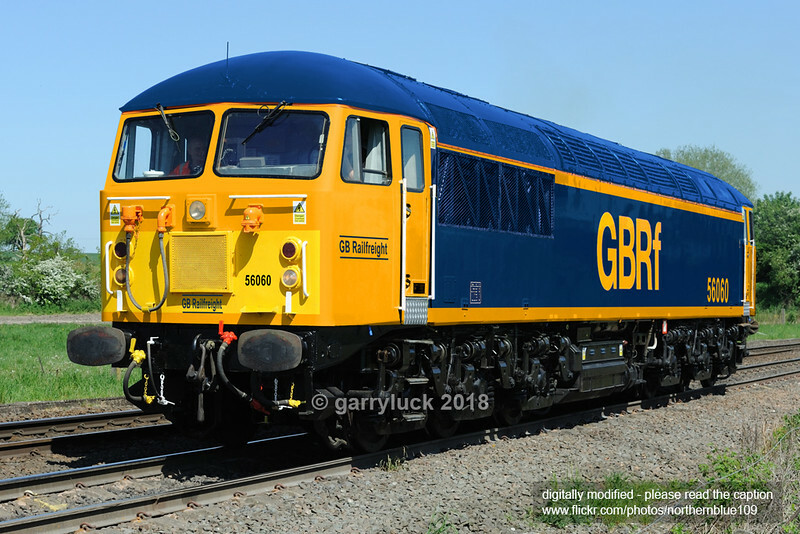 A rough idea of what a class 56 might look like in GBRf colours. Image copyright: Garry Luck (based on an original photo by Ben Wheeler). Although exact locomotive numbers are yet to be officially identified, it is thought that they include 56007, 018, 031, 032, 037, 038, 060, 065, 069, 077, 081, 098, 104 & 106 from Leicester and also 56009, which is currently located at the Battlefield Line Railway along with 56128, which has been at CF Booth’s scrap yard in Rotherham since last year. The Class 56 Group’s two locomotives, 56006 & 56301, are not included in this sale in any shape or form.